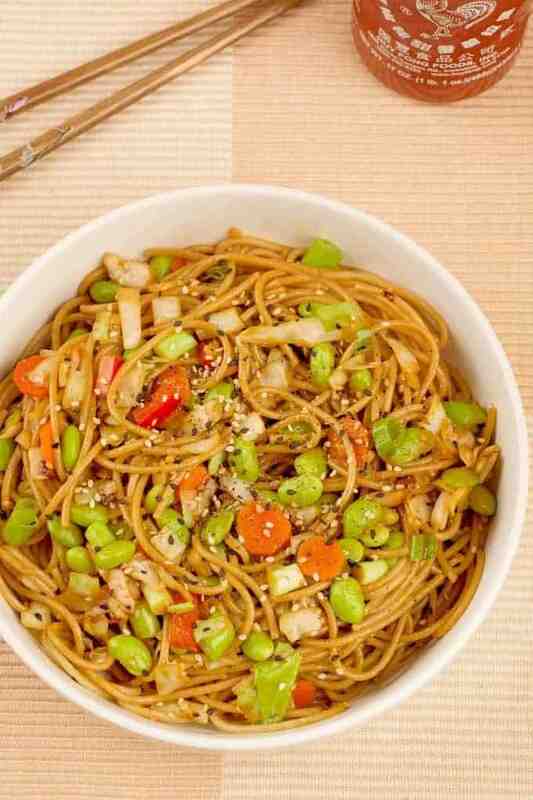 This easy sesame noodle variation makes a satisfying meatless meal with a tasty Asian flair. 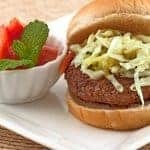 It combines whole wheat spaghetti and shelled edamame with a light, flavorful peanut sauce, sesame seeds and a crisp combination of stir-fried cabbage, carrots, red bell pepper and scallions. 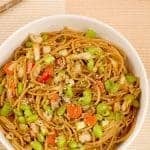 This quick variation on sesame noodles uses whole wheat spaghetti combined with edamame, stir-fried cabbage, sesame seeds and a light peanut sauce to make an easy, meatless meal. Bring a large pot of salted water to a boil, add the edamame and boil until tender, 3 to 4 minutes. Using a slotted spoon, transfer the cooked edamame to a bowl and return the water to a rolling boil. Add the spaghetti and cook according to package directions. 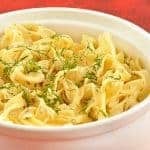 Drain thoroughly, return both the noodles and edamame to the pot and set aside. 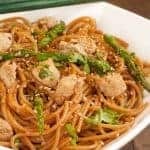 Prepare the sauce by whisking the soy sauce, rice vinegar, sesame oil, peanut butter and sriracha together in a small bowl. Pour over the noodles and edamame, toss to combine and set aside. Tip: Microwave the peanut butter for 15 to 20 seconds on 80% power to make it easier to combine. Heat the vegetable oil in a wok or large frying pan over high heat. Add the cabbage and stir fry until tender and golden, 3 to 4 minutes. Add the sliced carrots, bell pepper and garlic and continue cooking, stirring constantly, for 2 minutes longer. 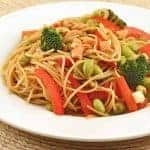 Add the scallions, sesame oil and sesame seeds, cook for an additional 30 seconds, then add the entire mixture to the noodles and edamame and combine thoroughly. Plate individual servings and offer extra sriracha at the table for those who like a bit more heat.